Our challenge at 613 Ave Create this weeks sponsor is Bugaboo and the theme is make a post it note holder or anything goes. I am using this stamp called make it snappy friends. I printed the image onto neenah cs and water-colored the image with cotmans watercolor paints. My card base is Staples 110 lb vanilla cs cut at 4.25 x 11 and scored at 5.5 and then the top half was folded in half again. The DSP is from DCWV. It doesn't show much but I wanted the card stock front to look good when it was folded. I added recollections kraft cs around the image for more of a focal point. I stamped two of the SU petite flowers polka dot stamp and punched it with the matching punch. The flowers were inked using kiwi kiss. I had two green gems that I put in the center of the flowers. I was just going to glue the post it note onto the bottom of the easel but decided to make a box to put it in instead. The first box I made didn't fit the post its so I had to recalculate and redo it. 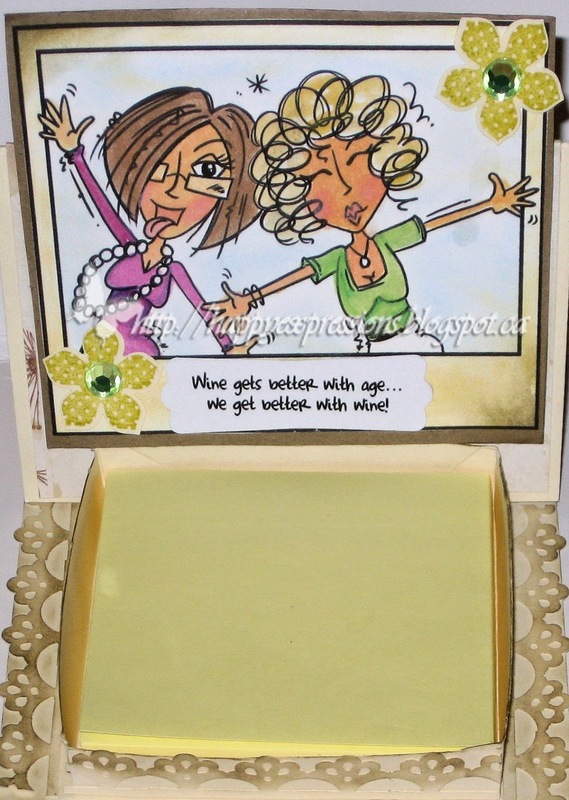 I used MS border punch and added a small edge on each side and on the front of the box. They were distressed with SU crumb cake ink. The sentiment is from another bugaboo stamp. Such a great project and love the image!!! Love that sentiment and the idea if a box for your post its is so creative!! Nicely done Carol!